Skinny Bird Review - How Does It Compare? 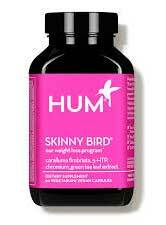 Skinny Bird is a diet pill produced in America by a company called Hum. It’s suitable for vegans and vegetarians and has the added benefit of being gluten-free. 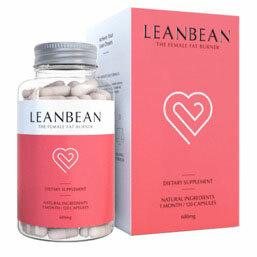 Unfortunately, our evaluation of the product’s potential as a weight loss aid suggests it’s primary value is likely to be as an appetite suppressant. Most people who are struggling to lose weight need help with hunger control, so the fact that Skinny Bird should be capable of providing this is good. However, although the formulation contains a good fat burning ingredient, the inclusion rate is far too low and, despite Hum’s best intentions, the product is unlikely to have a lot to offer in other areas. The formulation also appears to cause some users to experience side effects. So, although Hum is a respected supplement supplier that has commendable ethics, the Skinny Bird diet pill formulation leaves a lot to be desired. One capsule is needed three times each day and the best time to take the capsules is 30 minutes before a main meal. 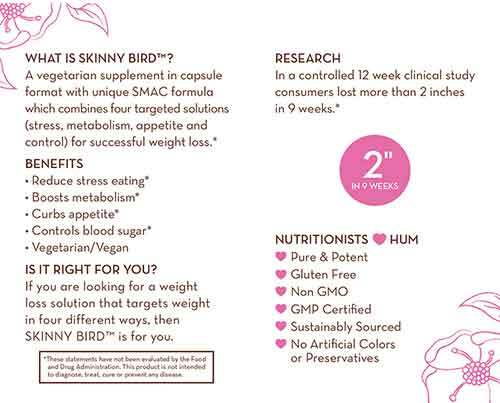 Hum points out Skinny Bird is not intended for women who are pregnant or nursing a child and suggest people who have existing health issues seek medical advice prior to using the product. They make the same suggestion to anyone who is using prescription drugs or medications. Caralluma Fimbriata Extract (333mg): A cactus extract with a long-standing reputation as an appetite suppressant. Scientific investigation proves Caralluma Fimbriata works well and 1g per day has been shown to be an effective dose, so the amount provided here should be adequate. 5-HTP (100mg): An ingredient that is sometimes added to supplements because it boosts serotonin production. This important neurotransmitter is responsible for regulating the mood, appetite, sleep, and certain other biological functions. However, although 5-HTP is not without merit, it is not tolerated well by all. Green Tea Extract (66mg): A proven metabolism booster and fat burner that can keep on working for up to 24 hours. Unfortunately, the amount provided here is likely to be too low to offer much in the way of benefit. Chromium (200mcg): A mineral that regulates insulin action and provides blood glucose control. Research suggests 200-1000mcg per day is an effective dose, so the amount provided here is just right. Some people say Skinny Bird works, others say no, and still others claim using the product made them feel unwell. It’s also worth mentioning, the value of most of the positive reviews is brought into question by the fact that the people supplying them are also offering discount codes that, if used, would also earn the code supplier a discount on future purchases of Hum products. The most commonly reported side effects are nausea, vomiting, and headaches. It’s never encouraging when customers report side effects such as these, so we suggest this product not be used without a doctor’s approval. A number of Amazon sellers appear to be selling Hum products, but there is no way to be certain the articles offered are the real McCoy and the prices are always significantly higher than the ones shown on the Hum website. So, if you want to buy a bottle of Skinny Bird, the manufacturer’s website is always the best place to go. The fact that Hum Skinny Bird provides an adequate quantity of Caralluma Fimbriata is good because that should allow the product to offer assistance to people who have difficulty keeping their appetites in check. It’s also nice to see an effective dose of chromium because it’s ability to regulate insulin and control blood sugar levels makes chromium useful for preventing the blood sugar crashes that trigger cravings for high-calorie food. If 5-HTP can boost serotonin levels sufficiently to improve the mood, it’s conceivable that the formulation may reduce the likelihood of stress-related eating, but we have our doubts about its ability to do so. With such a low green tea inclusion rate, Skinny Bird is unlikely to get off the ground as a fat burner, so we’re seeing a few problems with this product and one of them is the lack of a money back guarantee. It has its merits, but Skinny Bird is not a product we can recommend.